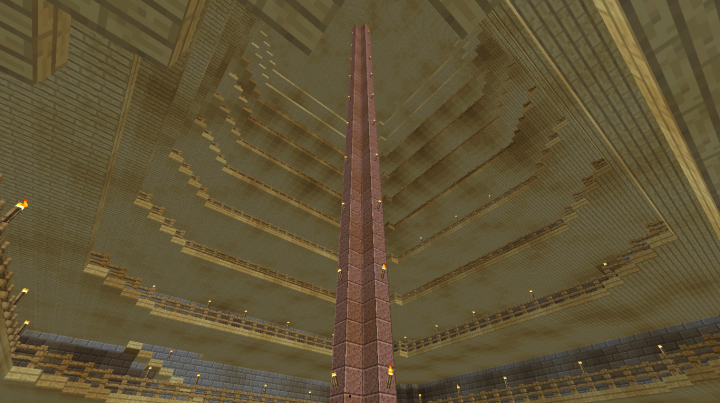 This tower is (loosely) inspired by Dante's Divine Comedy trilogy, specifically purgatorio. In the original poem, purgatory is envisioned as terraces on a mountain, where people not yet good enough for heaven have to overcome their sins. In the poem, there are terraces for the 7 deadly sins, 2 for special cases, and the garden of eden, making 10. I liked the idea of a spiral tower that reduces in width over time, like many pictures of the mountain. My tower might have sections named after each of the sins, but the purgatory theme is not necessary to the build. The coloured sections are where it increases, at a rate of half. Gray is the wall, light gray is for the flat parts around corners. The top part is considered the 7th layer. Yellow represents doors into the separate sections. From the interior, different sections will be isolated from one another. If you want to go from the bottom to the middle, you have to go outside and around the tower. Sections can occupy multiple floors, since the bottom sections are pretty tall. 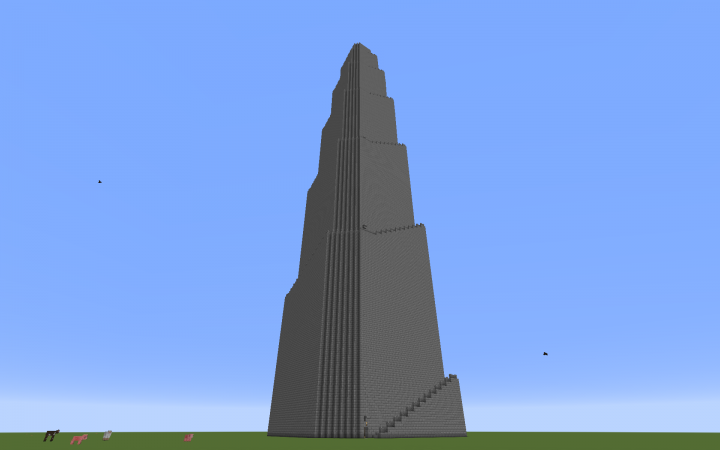 The total height is 180 blocks (that means you can build it starting at sea level and have about 10 blocks to spare). Width and length of the tower are 45 (through the middle). Anyone can use the picture and this description to build it for themselves. I'll be posting progress with the project as time goes on. For now, this project is going to happen in creative, because it's pretty huge, and I want to be able to show everyone pregress quickly. That said, I do hope to create it in survival one day. Serious progress is being made in the general structure. All the flooring is in for the first two sections, and the walls are of equal height. I have enough wood to continue with flooring, but that is difficult without walls present, so I will wait on that. Farming the other resources I will need (sugar cane, wool, milk, wheat, eggs) is coming along very slowly, peripheral farms are my next focus, but aren't directly linked to this build. the view in the first section shows the effect I'm trying to achieve with the design. Pulling the eye to the central pillar and showing off the vastness of the sections. Everything about the tower is meant to be imposing. "I liked the idea of a spiral tower that reduces in width over time, like many pictures of the mountain." PS: I like you have also added your blueprint - it shows that you not just built and preplanning can help so much! While building in survival, I found out the tower is too tall to build from sea level, so the smallest round is flat as well as the center. I didn't want the smallest part to be too small to be in, and I wanted six circles around with the staircase. 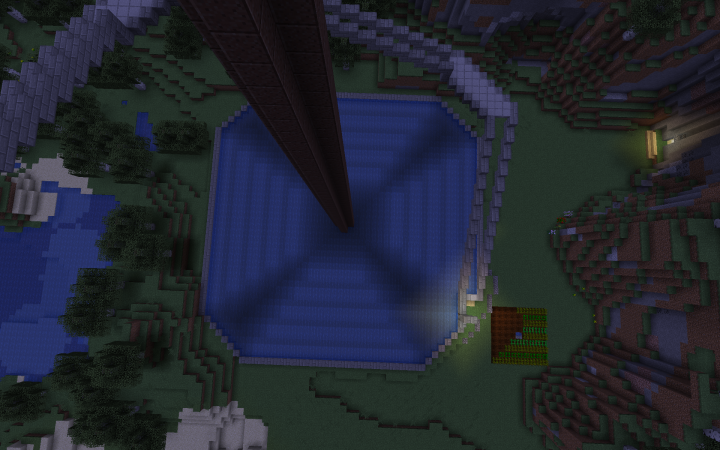 The main reason it got soooo big, was that I put all the pathways as 2 blocks wide, plus the outer wall. I wanted a staircase I could run up without hitting the sides. Planning it out was fun. I find that engineer's graph paper (10 lines to an inch) is better than MS paint. 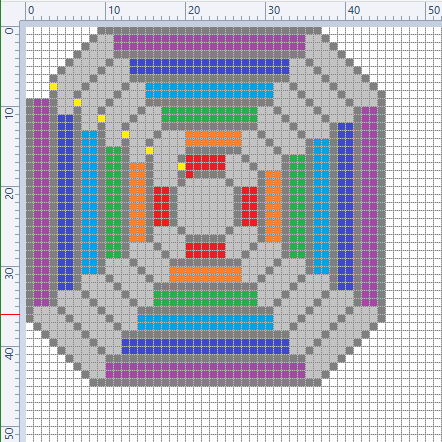 Regular graph paper doesn't have enough squares to fit a big build, and paint is uncooperative at such small scale. 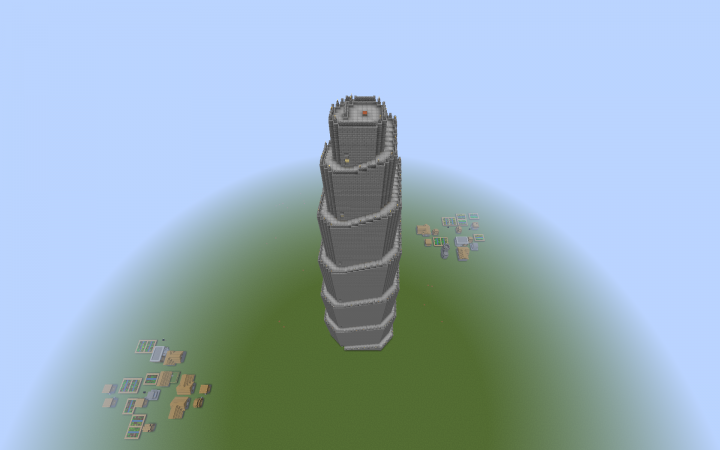 When I planned my spiral tower I thougth about the area on the top level first. I do not work with MS.Paint aswell - I use the free program paint.net. I earlier times I also used paper but a pixel coumputer program is just better for this. But honestly I would never use a a engineer's graph paper with 10 lines to an inch - 10^x meters are just better :D. After I finished the top level I started to think about how many time I want to go around the tower - 5 times were enogth. Next I copied this building four times with mcedit (so sad we cannot use it anymore ;( ) and built the staris; each one with one pathways wide more than the last one to see the diverence. I prevered the one with pathwide = 3. In your case I would even think about 1 for a moment because you tower is so much higher than my one.